New York City, NY — There have been a disturbing number of medical emergencies at abortion facilities reported by pro-life activists since late September, including nine ambulance incidents in six states. 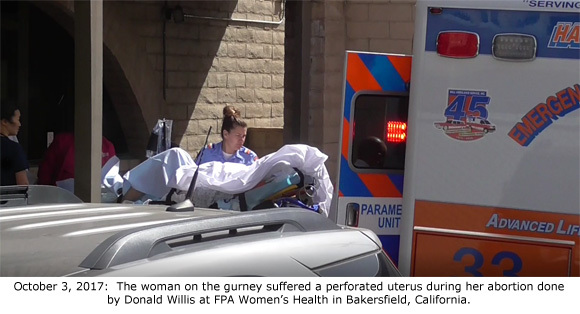 Bakersfield: For the sixth time this year, an ambulance was called to the FPA Women’s Health abortion facility on October 3, 2017, as earlier reported by Operation Rescue. A 23-year old woman suffered a perforated uterus and underwent an emergency hysterectomy to save her live once at the hospital. 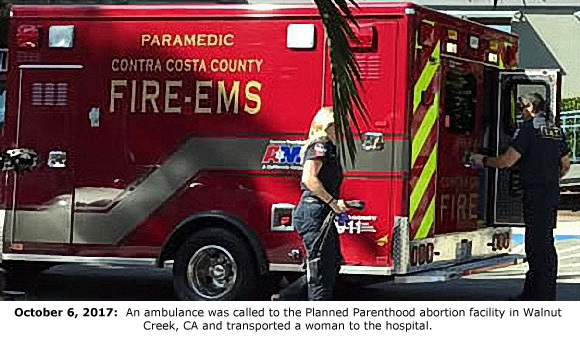 Walnut Creek: An ambulance was called to the Planned Parenthood abortion facility in Walnut Creek, CA, on October 6, 2017, a known surgical abortion day. Witnesses described the woman as looking “upset” as she was bought out of the Planned Parenthood abortion building and loaded into an ambulance. 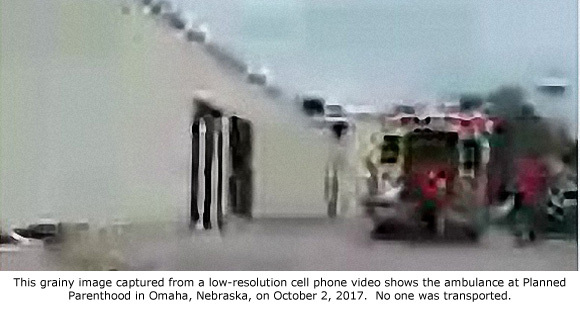 Omaha: Nebraskans United for Life report that an ambulance rushed to the Planned Parenthood abortion facility on October 2, 2017. A gurney was taken in to the facility, but the patient refused transport to the hospital. However, it must have appeared her condition was dire at one point, or an ambulance would never have been called. Bellevue: With lights from the ambulance flashing in the background, one pro-life activist recorded a brief clip of an incident at LeRoy Carhart’s Bellevue abortion business at approximately 7:00 p.m. on October 6, 2017. 911 records indicated a fire alarm had been tripped, but an eye witness says he saw a gurney removed from the facility with someone on it. This remains a bit of a mystery. This is the 16th ambulance spotted at a Carhart abortion business since 2012. 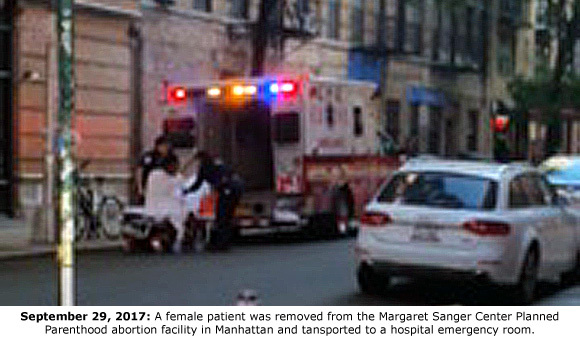 New York City: On September 29, 2017, at about 4:40 p.m., one pro-life activist stopped by the Margaret Sanger Center Planned Parenthood to pray when an ambulance was spotted. The woman was brought out of the facility in a wheelchair because gurneys cannot access the abortion procedure floors in the New York high-rise. She was transported to a nearby hospital. 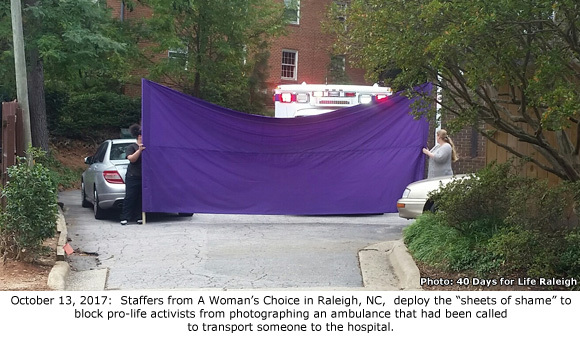 This was the seventh such emergency at this particular abortion facility so far this year. This facility had a series of failed inspections from 2013 to 2017. The most recent deficiency report indicated a likely incomplete surgical abortion that required a second surgery to complete. Cleveland: An ambulance arrived at the Preterm abortion facility on September 29, 2017 at around 2:00 p.m., as previously reported by Operation Rescue. The woman was wheeled out of Preterm on a gurney. Emergency responders took an additional 10 minutes to stabilize her in the ambulance before transporting her to a hospital emergency room. In 2014, Lakisha Wilson died from a severely botched abortion she received at Preterm. The September incident was the ninth emergency documented at Preterm by Operation Rescue since 2015. Houston: According to the Houston Coalition for Life, an ambulance and fire engine were photographed at the large Planned Parenthood abortion facility on Gulf Freeway on October 3, 2017. Once woman was transported. 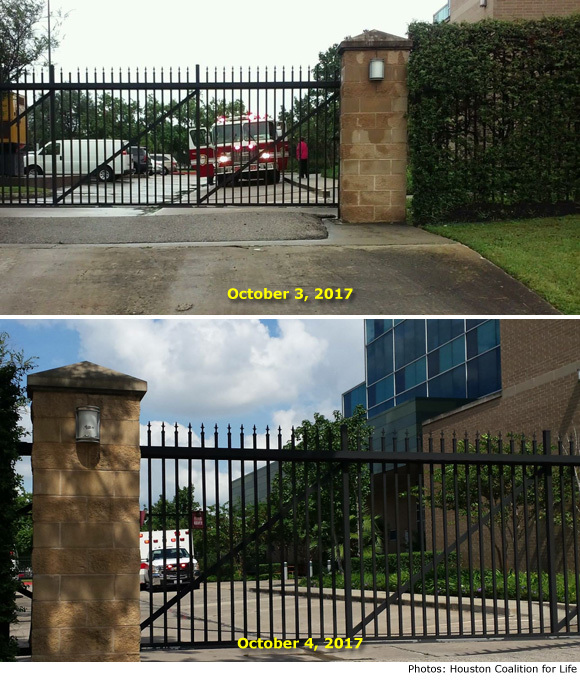 Houston: The next day, on October 4, 2017, another ambulance visited the same Planned Parenthood abortion facility and transported one woman with lights and sirens flashing, the Houston Coalition for Life reports. So far in 2017, Operation Rescue has documented 51 incidents where ambulances were called to abortion facilities around the nation. Of those 51 incidents, two-thirds (34) involved Planned Parenthood abortion facilities.